Today's Wednesday review is Crayola's Bathtub Crayons. When I saw these in the store I was kind of excited I thought L will love these! L loves to colour so bath time and colouring just seemed perfect. So last night it was bath time and I decided to surprise her with them and try them out for the first time. You get 10 colours in the package. 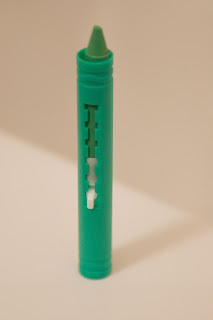 There is a little clicking part on the crayons that allow you to move them up out of their plastic casing. I find with the plastic casing I like it but then I also found that the crayon was very wobbly in it so you can't move the crayon up too fast or they will brake off. The Crayon has great colour and goes on pretty thick. 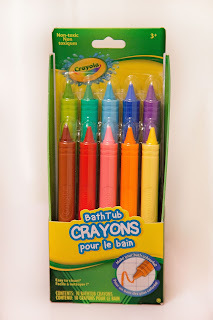 They are basically actual crayons just in a plastic case. 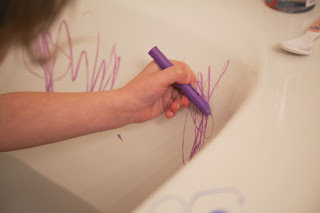 L loved these and drew all over the tub. She asked to draw on the tile wall so I told her to test it out in a little patch to make sure it would wipe off before we committed. When she drew she drew slightly in the grout between the tiles and we weren't able to get the crayon to come off the grout. So this should only be used on tile and bath and stay away from the grout. After a while of drawing (even the adults were colouring) it was time to get out and clean up so here is the real test. The crayon was relatively easy to wipe off with just a wet paper towel. If you touched any of the crayon with your hands it would come off onto your skin but easily washed off. The only issues with these that I found was that I have some pink left over crayon colouring that I can't seem to clean off of the side of the tub. So now I have a slight pink colour on the inside sides of the tub. It's not totally noticeable and I'm hoping in time it will come off. It was a little disappointing though to not be able to totally clean it up. I even tried using a mild bleach spray and that didn't help. All in all I like this product but probably won't use it again We tried the crayons again tonight and it left marks on the tub that I am having a hard time cleaning up and since the tub has dried marks that I thought I had cleaned are now showing from the other day. All in all I would give this product a 3 out of 5. It's a lot of fun and well constructed but leaves marks in the tub which just isn't something I want.